The students are in their own Year 5 and Year 6 Hub at the Faithfull Campus and are involved in similar subjects to those experienced while in the Early Years of schooling. Numeracy and Literacy are the main areas of learning with the students consolidating and developing skills and knowledge previously learnt in these areas. The other subjects that all the students participate in are; Integrated Studies (Science, History, Geography, Civics and Citizenship) Physical Education, Information Technology, Art, Music, Library and Indonesian. 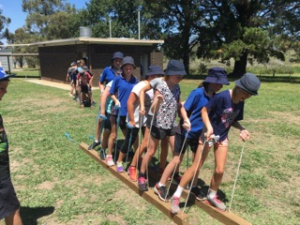 Community Services – students have to do 10 hours for the term on a community project of their choice eg assisting at After School Program, reading with the Prep students and Kindergartens, visiting Nursing Homes and teaching the elderly games. Improving Skills – choose an area they wish to improve. Examples of this year what some students participated in were learning new cooking skills, learnt how to ride a bike, learnt how to play the guitar, photography, knitting and improving football skills. Attending Community Events – have to attend community events eg. ANZAC Day Service and NADOC week. Cultural Experience –includes Aboriginal culture, and interviewing people who were born in foreign country. Religious Experience – this year students had a visit from a Salvation Army Officer and learnt about the Salvation Army also many students visited churches other than their own denomination. We have been currently working with the Bluearth Foundation who in turns works with the WHO Health Promoting Schools framework to encourage and support physical activity in schools. It is proven that physical activity supports the learning and development through enhancing cognitive performance, improving health and fitness, enhancing psychological and social wellbeing. A Bluearth teacher works with the students and staff every fortnight developing their physical and leadership skills. Staff are trained in Bluearth strategies so that they can take the program on alternative weeks. Year 7 stude nts experience studies in eight Learning Areas. Core subjects operate all year. These include Maths, English, Science, Humanities, Indonesian, Music, Information Technology and Health/Physical Education. Non-core subjects run for one semester. These include: Art, Drama, Food and Technology. This enables students to have experienced all subjects before choosing electives for Year Eight. Students have 18 periods of core subject with one main teacher. Within the core units students will study English, Mathematics, Science and Humanities. The Year 7 team are based in the B wing of the Faithfull St Campus. In 2017, we introduced the new Year 8 program, after the successful implementation of the revamped Year 7 program the previous year. The new Year 8 program continues the students journey through our newly developed Middle Years program, that involves teachers working collaboratively to improve students outcomes. Students experience seven core Learning Areas that run the entire year. These include; Maths, English, Science, Humanities, Health & PE, Music & Discovery. Students also select 4 electives across the two semesters which enrich the students learning through the subjects of; Art, Drama, Food Technology, Outdoor Education, Woodwork/Woodturning, Automotive, Textiles, Indonesian, Visual Communication, Plastics/Metals and CSI Science. This variety of subjects enables students to have a broad range of experiences across all Learning Areas before choosing further electives for Year 9. Discovery is a newly developed program that is aimed at addressing inter-domain capabilities by making links between the knowledge and skills within curriculum areas through integrated units of study. Within their learning programs students will have the opportunity to draw upon the links between their subject areas and to delve deeper into the big questions related to their learning. It would also provide the opportunity for the inter-domain capabilities to be addressed. The Year 9 Advisory Program is an Inquiry- based learning program where students explore aspects of Humanities and Science domains. The Humanities area incorporates History, Geography, Economics, Civics and Citizenship and the Science part incorporates Biological Science, Chemical Science, Earth and Space and Physical Science. Students also complete a Research Project in which students identify and research questions to develop their knowledge and obtain and explain evidence to support questions. Then they present their Research Project using new ICT skills to their parents and teachers. thinking skills in our students who are the Future Makers of their generation. The program forms an integral part of the Year 9 curriculum and continues across a full term of schooling. There are several components to the program – 15 Mile Creek Camp staff attend the college to deliver 10 lessons prior to the residential camp, students then attend the camp for 12 days (including a weekend) of intense instruction and activities to develop their personal and leadership skills, then 15 Mile Creek Camp staff follow up with another 6 lessons back at the College. Benalla P-12 College delivers an intensive, personalised careers program for all Year 9 students designed to improve student aspirations for successful Year 12 completion and beyond. Students develop an ‘Achievement Portfolio’ which includes a Career Action Plan, employability skills audit and evidence of their achievements. Students undertake mock job interviews which involve all elements of the job application process, including selection of appropriate clothing. This work, together with a record of activities from a personal presentation session held in the College’s VET Hairdressing Salon, is then presented to a family member during Year 10 course selection. The portfolios are stored in the Careers Room and are designed to be revisited over the next 3 years.